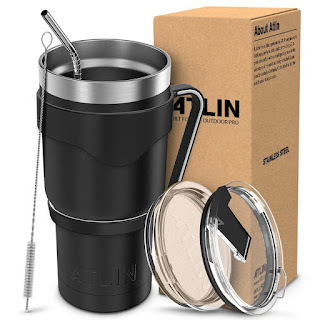 Today only, while supplies last, get this Atlin Tumbler [30 oz. Double Wall Stainless Steel Vacuum Insulation] - Black Travel Mug [Crystal Clear Lid] Water Coffee Cup [Straw + Handle Included] for ONLY $14.99 (Retail $29.99)! 100% stainless steel, grip- friendly design to keep hydrated wherever life takes you. Dishwasher- safe without the threat of toxins. The Atlin Tumbler is 7 5/8" high and carries up to 30oz of liquid; all while being able to fit in standard size cup holders. 2 layers of insulation to maintain your drink's temperature no matter the outside climate. Weather-proof clear lid to keep an eye on the status of your remaining drink.